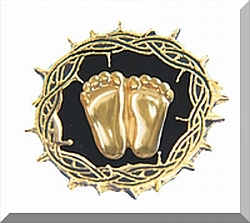 This Precious Feet Pin is available with a Gold Electroplate Finish. It shows the Crown of Thorns surrounding the Precious Feet with a black background. The feet are the size of a baby's feet 10 weeks after conception. This prolife pin offers a beautiful way to wear and display your Right to Life beliefs. This lapel pin would make a great gift for mothers, mothers to be and everyone who believes.